She who dies with the most looms wins. At this point I think I have 5 looms. 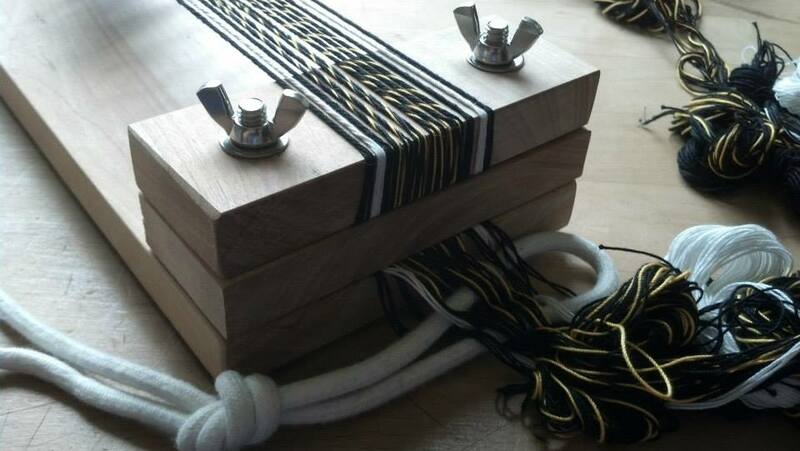 The simplest looms I have is this board loom. 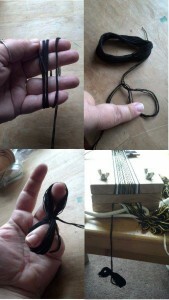 Aside from the backstrap method I believe it’s probably the simplest loom to build at home. My husband made my board loom from a 1×6 of quilted birch. The base is 5.5″ x 18″. The blocks at the end are each 2″ x 5.5″. 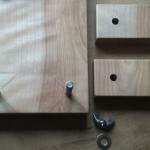 The ends each use two carriage bolts long enough to go through all three pieces of wood, two washers and two wingnuts. 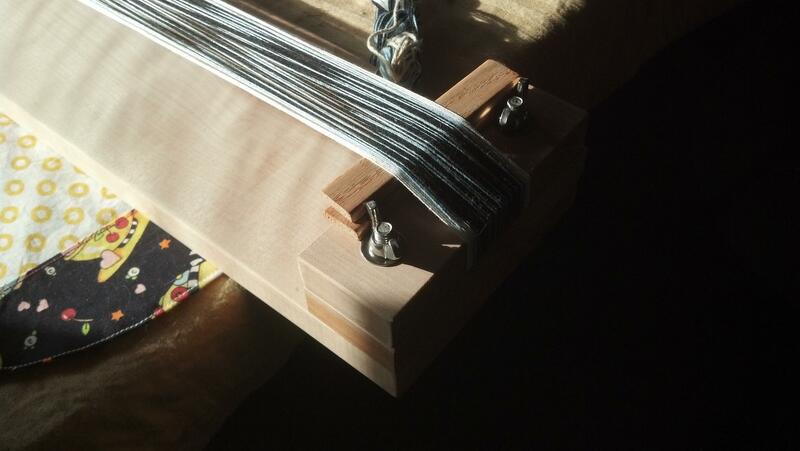 Because of the width of the blocks on the end (ie, the warp sits at about 2 inches above the base board) this loom works best with fairly small tablet weaving cards. I use the wooden cards I purchased from the Etsy merchant Ampstrike. The cards are about 2.2 inches square. 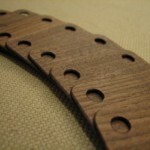 Each end has wood/wing nut clamps. 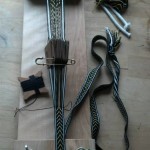 I add additional temporary tension to the warp by inserting small wooden blocks under the warp on either end. 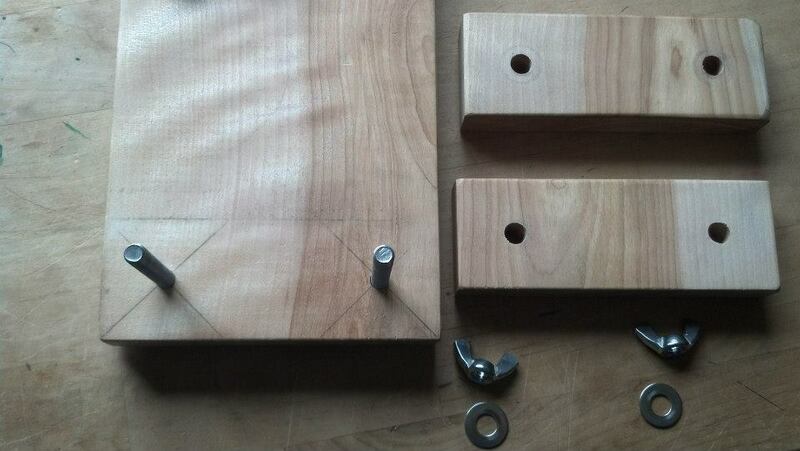 Each end has wood/wing nut clamps like this. 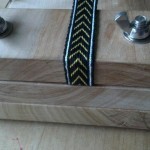 I add more tension to the warp by inserting small wooden blocks under the warp on either end. 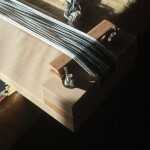 Closeup of the woven end of the loom. Closeup of the unwoven end of the loom. 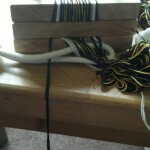 I use the large white rope to keep track of the cross-overs of the cords. Normally I chain up the rest of the warp.. but in this case since the pattern is turned all in one direction I needed to be able to get rid of the twist in the cords so I butterflied up all the rest of the cords. Closeup of the unwoven end with a butterfly for the far-left card dangling off the end of the table. 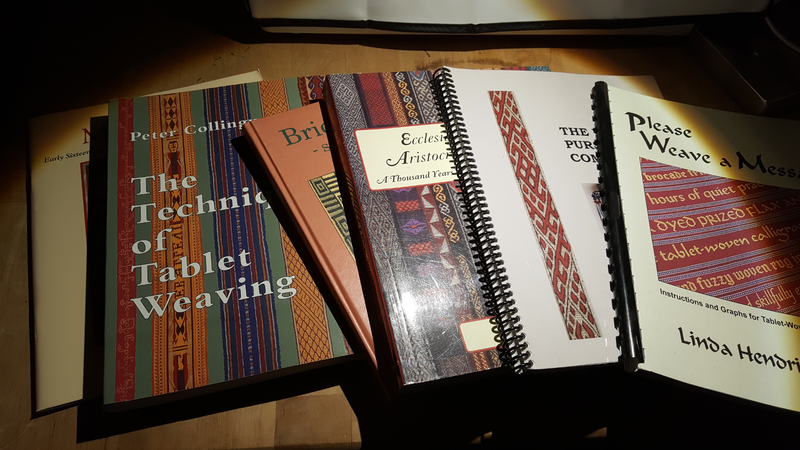 The pieces of the loom. 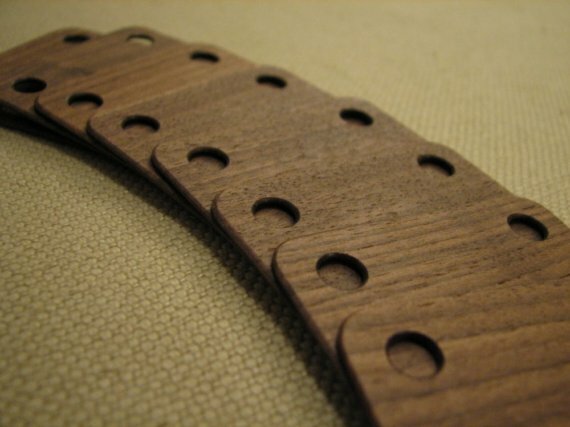 Each end consists of 2 wooden block (2″ wide), two carriage bolts (long enough to go through 3 boards), 2 metal washers (to protect the wood) and two wingnuts. 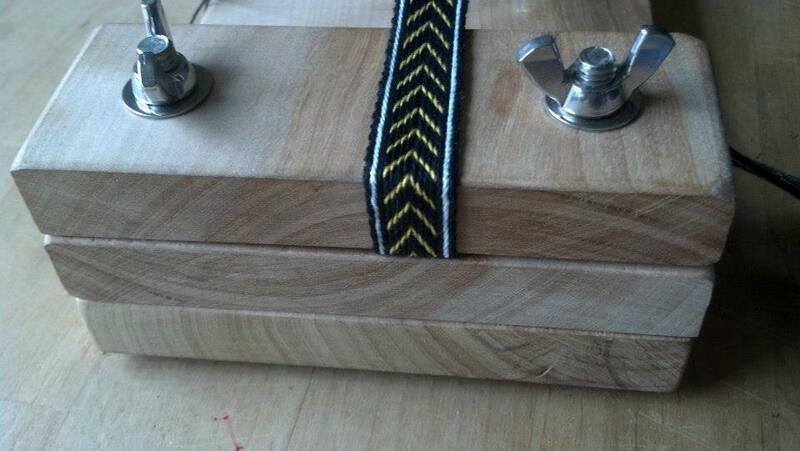 Eventually I might put wooden knobs on instead of the wingnuts to make it appear more “period”. Walnut cards from the merchant Ampstrike on Etsy. 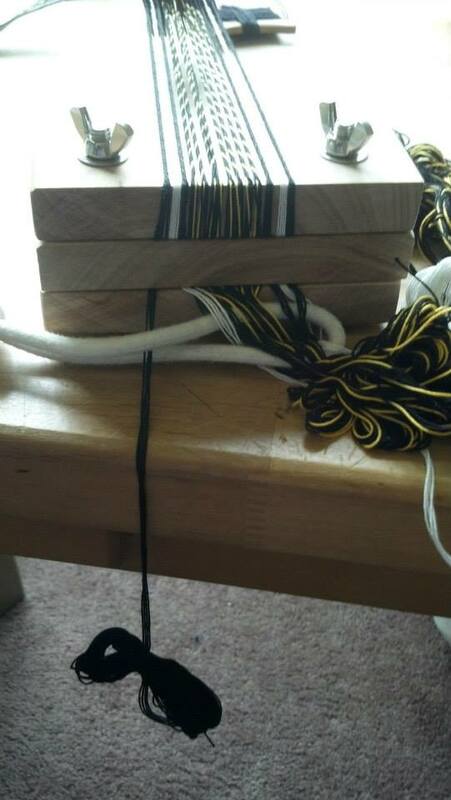 I use a separate warping board to measure out my warp and to add large white cord to maintain the crossover(helps to keep the strings in order). 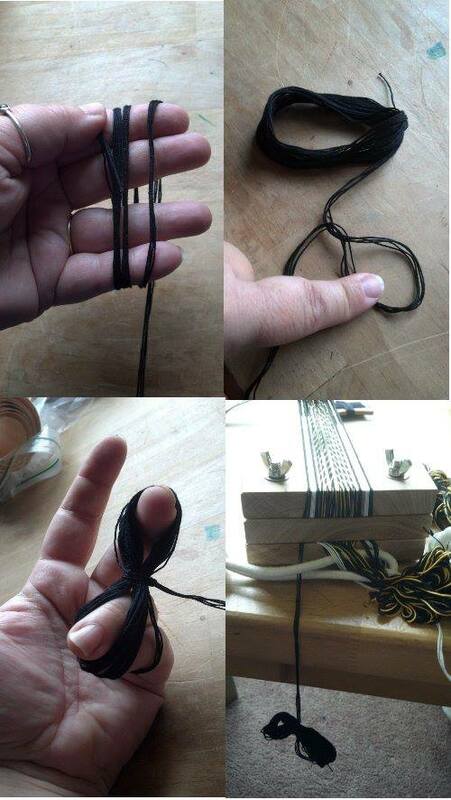 If my tablet weaving pattern builds even tension (ie, 4 forwards/4 back) then I will chain up the excess warp and simply pull out more warp as I advance the weaving. 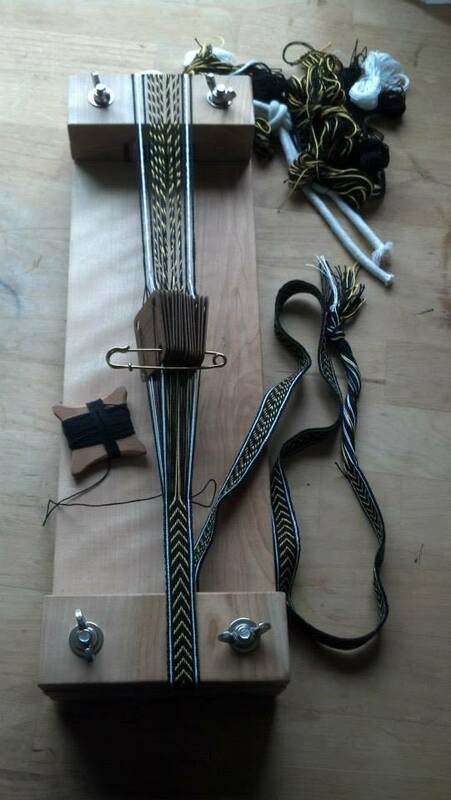 If my tablet weaving pattern builds uneven tension I will butterfly up each individual card and then spin the butterflies to relieve tension as I advance the weaving. Wooden cards: Wooden Tablet weaving cards I love the size and feel of the wooden cards from the seller Ampstrike on Etsy. Well worth the cost. I have purchased these in Walnut(2 sets), Padouk and Oak. The different colors make them easy to setup on the loom to make counting out a pattern very easy. The wood is very smooth and working on them is a total pleasure. 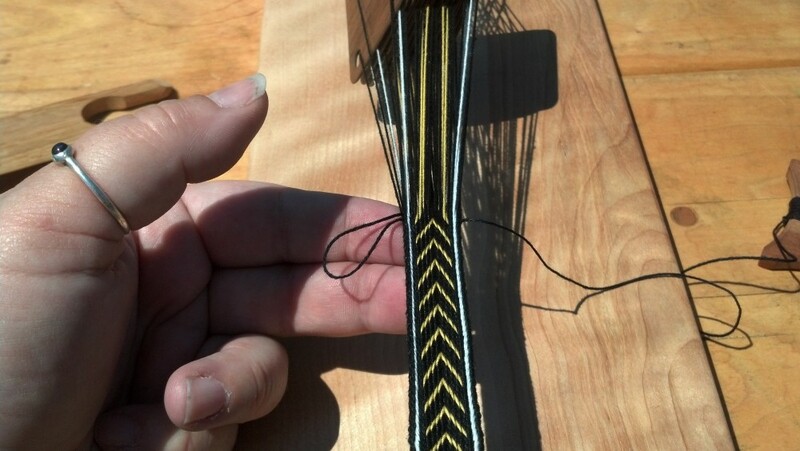 Starting at one end of the warp, wrap the warp threads for one card around your fingers until you get to the place where you want the bundle to hang(upper left). With the double-twisted loop I’ve found this to be fairly secure.. and fairly easy to remove the loop, carefully pull more warp out of the butterfly and then re-secure the loop. This works for securing the excess.. but not for providing tension. 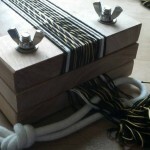 If you need tension you may need to add weights to the butterflies and treat the loom like a warp weighted loom. I do so love your loom. 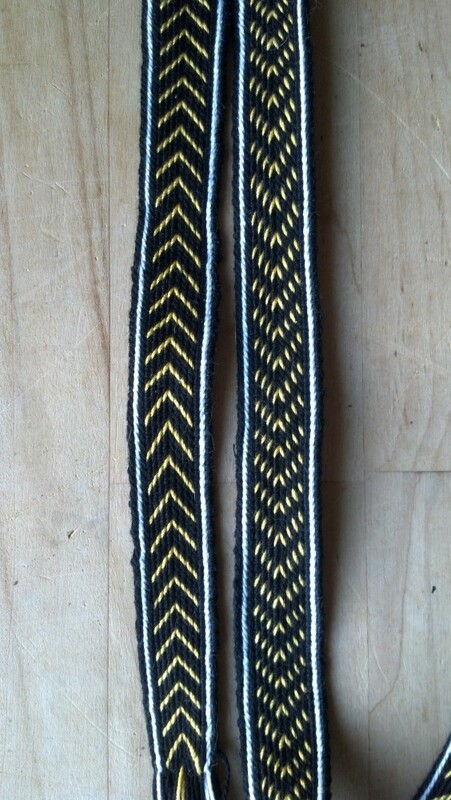 I plan to make one for myself (just a newbie at card/tablet weaving). Thank so much for sharing. Melisdande, Canton of Saint Georges, Barony of Nottinghill Coill, Kingdom of Altantia.